In recent years, silicone has been used especially in the automotive sector, but now it is being found in more and more applications. Due to it many positive attributes, silicone is a very popular material for cable production and has also played a major role in the continuous development of Rosendahl’s lines. 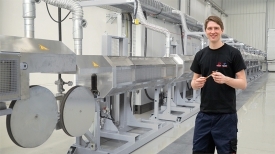 Rosendahl already developed the first silicone extrusion line with infrared curing 4 years ago. In the meantime, several new lines have been installed worldwide and also existing lines were able to be expanded by updates from Rosendahl. The special matching extruders, crossheads and curing tunnels make effective and reproducible results from one provider possible. On the automotive cable market, silicone has established itself as an ideal isolation and jacketing material for cables and high-voltage cables for electro and hybrid cars. The continuous operating temperature of 200¬∞C and the high flexibility of this material doesn’t change, even at various temperatures. Due to its high temperature resistance, silicone enables us to reduce conductor cross-sections and minimize cable weight. In addition to the automotive sector, there are also several other popular applications for silicone, for example in medical technology or robotics. Since the fire resistance of cables in public buildings, such as airports or hospitals, is subject to particularly strict guidelines, Rosendahl focused on developing production facilities for this field. The standards that needs to be fulfilled for integrity DIN 4102-12 and insulation IEC60331, EN50200 and BS6387 are fulfilled by every cable produced by Rosendahl. For further information please visit Rosendahl Nextrom’s website www.rosendahlnextrom.com.